This book develops a central theme: legal persuasion results from making and breaking mental connections. This concept of making connections inspired the authors to take a rhetorical approach to the science of legal persuasion. That singular approach resulted in the integration of research from cognitive science with classical and contemporary rhetorical theory, and the application of these two disciplines to the real-life practice of persuasion. The combination of rhetorical analysis and cognitive science yields a new way of seeing and understanding legal persuasion, one that promises theoretical and practical gains. The work has three main functions. First, it brings together the leading models of persuasion from cognitive science and rhetorical theory, blurring boundaries and leveraging connections between the often-separate spheres of science and rhetoric. Second, it illustrates this persuasive synthesis by working through concrete examples of persuasion, demonstrating how to apply this new approach to the taking apart and the putting together of effective legal arguments. In this way, the book demonstrates the advantages of a deeper and more nuanced understanding of persuasion. Third, the volume assesses and explains why, how, and when certain persuasive methods and techniques are more effective than others. 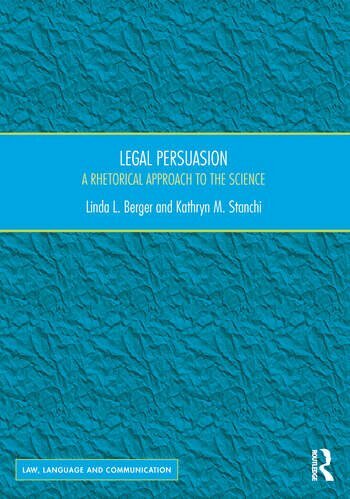 The book is designed to appeal to scholars in law, rhetoric, persuasion science, and psychology; to students learning the practice of law; and to judges and practicing lawyers who engage in persuasion. Linda Berger is the Family Foundation Professor of Law at the University of Nevada, Las Vegas, William S. Boyd School of Law. Professor Berger has been a leader in building the discipline of legal writing. Her recent scholarly work blends interdisciplinary study with rhetorical analysis, drawing on research findings from analogy, metaphor, and narrative studies in order to examine the persuasiveness and effectiveness of written and oral communication. Kathryn M. Stanchi is the Jack E. Feinberg ’57 Professor of Litigation and Affiliated Professor of Gender, Sexuality and Women’s Studies at Temple University Beasley School of Law. She is recognized as the leading scholar to bring persuasion science into the literature of legal persuasion. Her scholarship often focuses on the intersection of persuasion, rhetoric and feminism. She has published and lectured extensively on this and related topics.